Sixth Course is located at 1544 15th Street in San Franciso's hip Mission district. Tucked away on a quiet side street in San Francisco's Mission district, Sixth Course is a hidden gem awaiting your discovery. 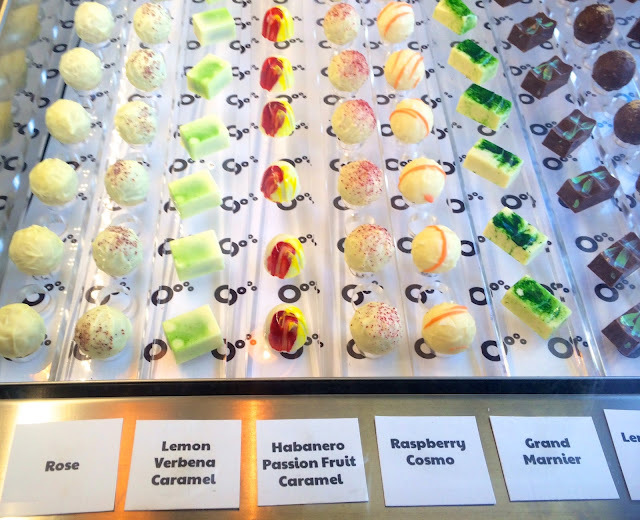 This trendy upscale dessert place offers fancy French-style pastries, chocolates and ice cream. Celebrate San Francisco's unusually summery weather with a refreshing Gelato Pop from Sixth Course. The North Beach (pistacchio gelato) and Valhrona (dark chocolate) are absolutely delicious!! These little frozen ice cream pops come in different flavors, all coated in fine Valrhona chocolate. Everything is handcrafted by Sixth Course's two experienced pastry chefs. An amazing assortment of chocolate truffles are made in house. It's fun to try the unusual flavors like Habanero Passion Fruit Caramel (my favorite!) and Raspberry Cosmo, inspired by the classic cocktail. Sixth Course also has more traditional truffle flavors like Amaretto and Salted Caramel. Pastry counter at Sixth Course! Sixth Course is open Wednesday through Saturday from 12pm until 10pm so it's a great place for an afternoon treat or an after-dinner dessert. On Sunday, the shop is open from 12noon until 6pm. Sixth Course is a special dessert experience that should be savored!